A box of fine chocolates complimented with a half-dozen fresh red roses and a scattering of red rose petals amongst warm flickering candles. Top it off with a bottle of chilled Champagne - all arranged in-cabin waiting for your arrival. 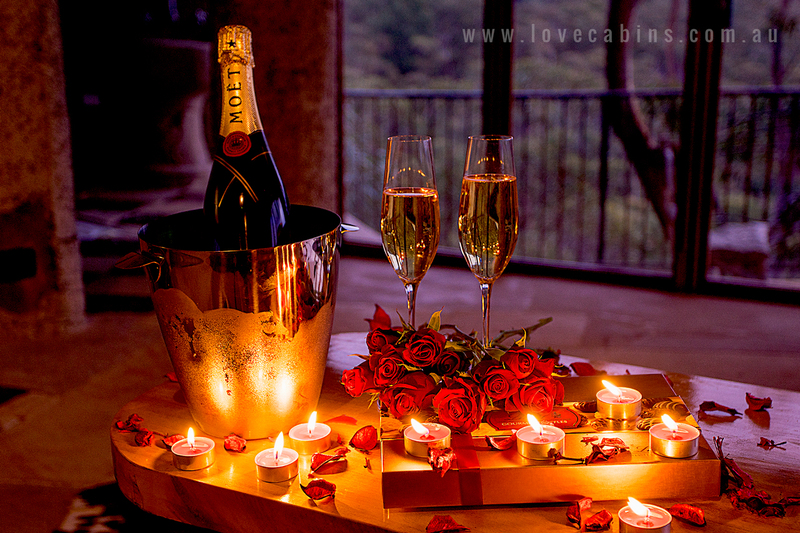 This is the perfect way to start your romantic getaway at Love Cabins. Our pre-arranged romance packages can be booked by anyone staying in our cabins. Available and ready for your arrival on the first night of your stay. Please contact us to customise delivery times and package components. Please allow a minimum 7 day notice required to arrange. CANCELLATION POLICY: Cancellation of a romance package 2 weeks or less before the arrival date are not refunded. Cancellations more than 2 weeks are refunded minus a $60 admin charge.